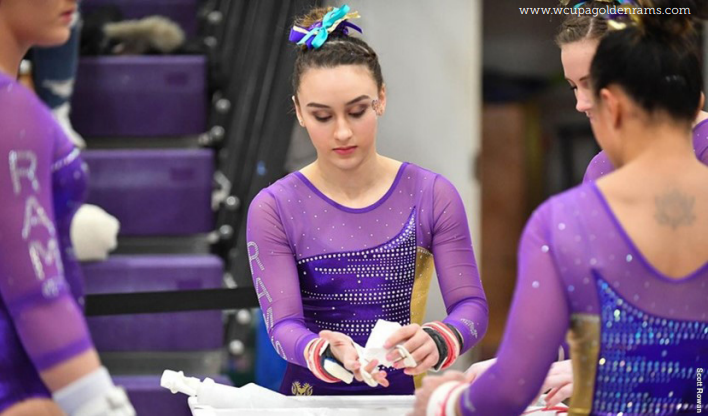 On Saturday, Feb. 3, the West Chester University Gymnastics Team (7-2) competed at Rutgers University. The Golden Rams competed against Rutgers Universtiy, Ohio State University, and UW-Whitewater. The Rams knew that it was going to be a tough rivalry, but they certainly held their own. The Rams started the competition on the balance beam. Senior Meghan Chan started the team off with a beautiful routine scoring a 9.6. Her routine was followed by two extremely strong routines. Freshman Yoli Nodarse scored a solid 9.7, as well as sophomore Sarah Boyd. Picking up the meet, the Rams continued very strong on the floor. Sophomore Jordan Miranda scored a solid 9.6. Her routine was followed by senior Madi Brent’s stunning routine scoring her season high of 9.750. Following her, freshman Jessica Meakim scored a 9.7, and junior Emily Loughery closed the event with her beautiful routine scoring a 9.675. Vault has been the toughest event for the Rams, but they certainly did not let this show. Continuing with their momentum, the Rams scored their season high on vault scoring a 48.1. Sophomore Natalie Onderko started them off with her season high 9.525. Continuing with the momentum, sophomore Paige Parsnik and senior Rachel Blair scored their season highs of a 9.575. Junior Lindsey Mathis also scored her season high of a 9.675. Finally, Chan scored her season high 9.750 with an amazing Yurchenko layout full. Onto the bars, sophomore Miranda led the team off with her season high 9.50. Freshman Yolanda Nodarse made her first appearance on bars scoring a solid 9.475. Closing the event, freshman Melanie Wojewoda scored a solid 9.625, and junior Myranda Marshall finished with her beautiful routine scoring a 9.525. On Monday, Feb. 5, The Golden Rams took on Ursinus in a dual meet on their home turf. The Rams won the meet scoring their season high score of a 192.25 against the Bears scoring a 186.075. The Rams certainly had their strongest meet of the season, and they had a terrific meet. The energy was high, and the team did not let two meets in one weekend affect them. Being the home team, the Rams started the event on vault. The vaulters must have had glue on their feet because four out of the six of them stuck their vaults. Senior Blair stuck her incredible Yurchenko tuck full scoring a 9.55. Meakim stuck her Yurchenko layout half vault scoring her season high 9.725 placing her first on the event, and senior Chan anchored the event sticking her gorgeous vault scoring a 9.675 placing second. Moving onto bars, the team scored very consistent solid scores. Miranda started the event with a 9.50. Following her Onderko scored a 9.50. Nodarse scored a 9.525 placing her third, and Chan scored a 9.550 placing her second on the event. Wojewoda scored a 9.4, and Marshall closed the event with her beautiful routine and stuck dismount scoring a 9.70. Moving onto the beam, Chan started the Rams off with a beautiful routine scoring a 9.55. The Rams continued to take off from there. Junior Cassie Hageman scored a 9.50. Going up from there, Loughery performed her season high routine scoring a 9.7, tying for second, and then Nodarse followed tying her season high 9.775 placing her first on the event. Closing the event, Boyd hit an amazing routine scoring a 9.7 tying her for second. Closing the meet, the Rams had their best performance on the floor scoring their season high 48.425 on the event. Parsnik started off the event with her season high 9.575. Following her Hageman scored her season high 9.675 and tied for third with Meakim. Brent tied her season high 9.750, and she placed second on the event with Loughery also scoring a 9.750. The Rams have a few tough meets coming up. They will take on Cornell, SUNY Brockport, and Ithaca on Saturday, Feb. 10. The Rams have already taken on Ithaca this season, but the next two competitors will be new faces. Cornell is currently only one place ahead of The Rams in the USAG collegiate rankings, and it should be a great meet. They will take on a quad meet at Temple the following weekend, and the Rams are hoping to finish with a victory at both meets. Jessica Meakim is a first-year student majoring in business. ✉ JM883960@wcupa.edu.